Wash napa cabbage and chop into bite-sized pieces. Put chopped cabbage pieces into either very large bowl or several gallon-sized ziploc bags. Massage salt into the cabbage and pour water into salted cabbage bowl or distribute among bags. Let rest for 2 hours. Combine fish sauce, Korean pepper, green onions, garlic paste, ginger paste, onion, apple, and sugar in food processor. Blend until all items are finely chopped. After 2 hours, rinse cabbage in cold water 5 times. This will get rid of a majority of the salt. Strain as much water as possible from cabbage. Place cabbage in large bowl and massage (I like to wear gloves to protect my hands, but it’s not totally necessary) spice mix into the strained cabbage. Put spicy cabbage mix into glass jars and refrigerate. 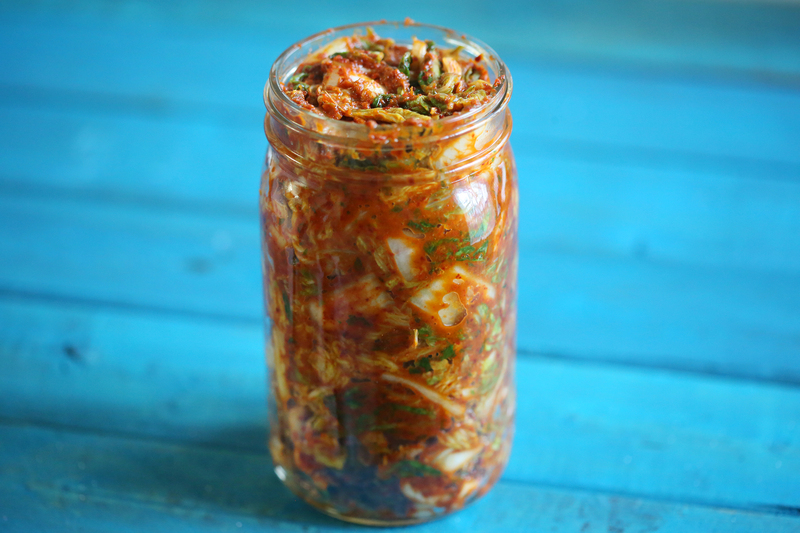 Kimchi will last several months if kept refrigerated. The longer it sits, the more probiotic bacteria will thrive. It will become more sour (kind of like sauerkraut) but definitely delicious. 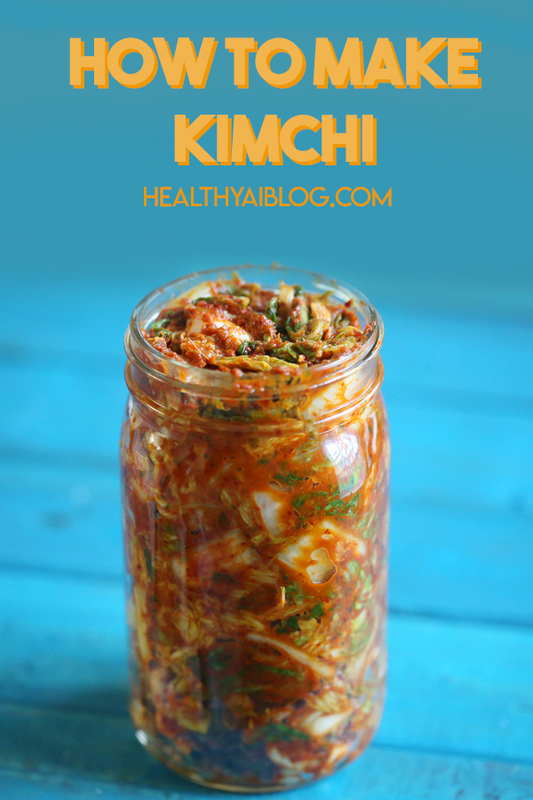 I like to use sour kimchi in cooked dishes like fried rice, soups, and stews. I’m not Korean, but I have eaten a LOT of kimchi. This recipe may not be totally authentic, but it is really tasty. It doesn’t have shellfish (my husband is allergic) and if you wanted, you could use coconut aminos or soy sauce to amp up the umami flavor to make it vegetarian/vegan. This is a variation on the very first kimchi recipe I tried. But this one does not have daikon radish because I live in an area that doesn’t have daikon readily available. apples in kimchi! That sounds interesting! Oh I LOVE kimchi! I can’t wait to try this recipe! So, I’ve never tried kimchi, but have friends that swear by it. This recipe definitely makes me want to try it. Do you eat it by itself also?